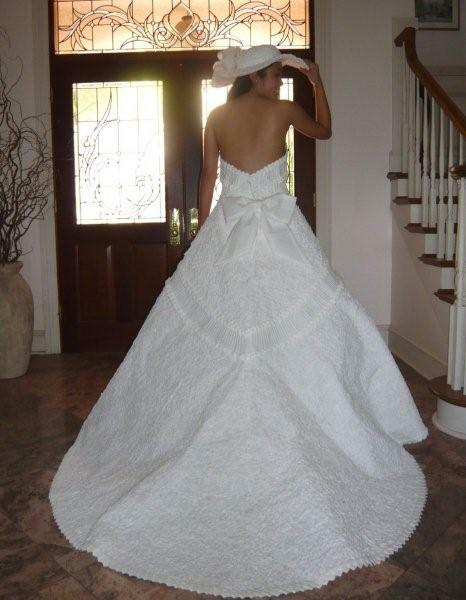 But not just any kind of paper... Hawaii's Ann Kagawa Lee took top honors for designing and entering this incredible wedding dress in the 2009 Cheap-Chic-Weddings.com Toilet Paper Wedding Dress Contest. Believe it or not, the gown was made entirely of bathroom tissue, tape, and glue! 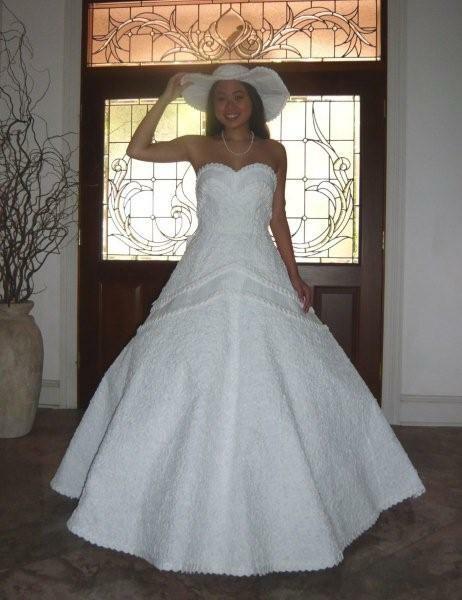 Ann, who retired in 2008 from a career as an attorney, turned to Japanese origami techniques to create stunning detail on a Gone with the Wind-inspired dress and hat. It was only the second time she had entered the contest, having taken third place in 2008. Ann, who designs and sews clothes as a hobby, entered the contest on a whim after she enjoyed making a spur-of-the-moment toilet paper dress at a bridal shower. If you're feeling incredibly creative, entries for this year's contest are being accepted until May 15. Rules and information about the prizes can be found here. The winning dresses are displayed at Ripley's Believe It or Not Museums around the world. Giveaway for a gift certificate to spend on anything your heart desires at CustomQuilling.com ends Monday, May 3. Enter here! WOW! Even more impressive than what it is made out of, is that she can actually wear it! Amazing. OMG that is amazing, I keep looking at it in disbelief. Seriously?! That's incredible. Glad that she won't be coming to any of the bridal showers that I know of and competing in the dress game. She'd for sure win!! I never would have guessed that was made from toilet tissue. It's absolutely beautiful. That hat is just amazing. I can't even believe that! GORGEOUS! absolutly fantastic! i wonder how comfortably it wears? haha it looks soft! Wow...I bet that would difficult to move around in. Be scared of ripping it or something.